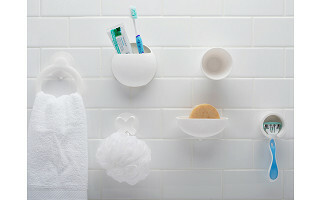 Some wall mounted bathroom accessories can seem one-note, because, well, they are. The carefully designed organizers from SAN-EI are several steps above the rest. The Japanese Makers are known for their approach to better living through small but significant design improvements. And they apply this approach to their collection of accessories that store bathroom essentials. Crisp white pieces lend a clean feeling to the bathroom and showcase the minimal—but thoughtful—design. Strong suction cups keep the organizers in place, but are easy enough to move or reconfigure. The designs come apart for better cleaning, too. 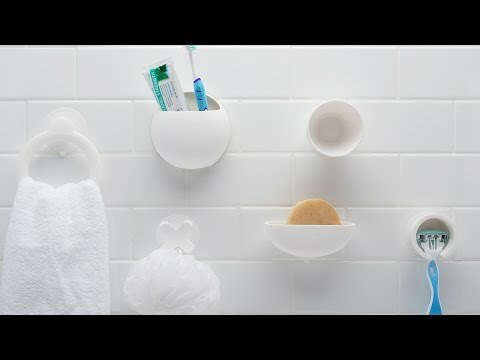 Other touches, like drainage holes in the soap dish to help prevent build-up, and razor and toothbrush holders that let them dry properly are simple but effective. It’s that careful consideration of details that sets them apart. Hello everyone! Mei and Kaori here from SAN-EI. We're proud to introduce our SAN-EI products to The Grommet. We'd be happy to answer any questions you have! I have such a problem with items staying put using suction devices.....how are yours any different? @jade Thank you for your question. If it is completely flat surface, our products stick to the surface tightly. When you have a problem using suction cup, you should let suction cup get wet, it is a tip. Hope it helps. Will these stick to a wall or only tile? @michelle Thank you for your question. They stick to a wall and tile as long as it is completely flat surface. If it is textured, it doesn't stick. Will this work with natural stone wall in a shower? I have bought other suction devices and they don't work. @laura Thank you for your question. If the wall in your shower has curves or dents, it won't work. But it will stick to the wall if it is flat. Would the razor holder also hold an Intuition razor? This one has a larger head as its head/blades are surrounded by a thick band of soap. you only show the Razor, Tooth Brush holder and soap holder. I see other items in the video. Are they available? @Linda Thank you for your question. Suction Towel Ring, Shower Hook and Water Cup are also available. @Tim Hi Tim, thank you for your interest in our products. Sorry we sell three items in a set so it is not be able to buy it individually. Apologize for inconvenience. 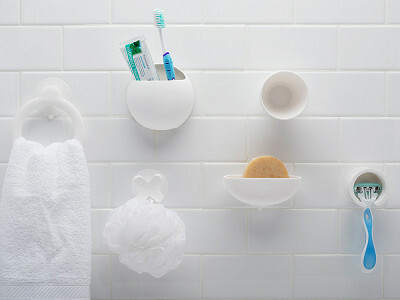 Some wall mounted bathroom accessories can seem one-note, because, well, they are. The carefully designed organizers from SAN-EI are several steps above the rest. The Japanese Makers are known for their approach to better living through small but significant design improvements. And they apply this approach to their collection of accessories that store bathroom essentials. Crisp white pieces lend a clean feeling to the bathroom and showcase the minimal—but thoughtful—design. Strong suction cups keep the organizers in place, but are easy enough to move or reconfigure. The designs come apart for better cleaning, too.